Your alarm has gone off, and it’s time to get up for work or the day ahead. You drag yourself out of bed, lazily pour that all important cup of coffee to try and boost your energy levels, have some breakfast (maybe), and then get ready to hop into the shower so that you can finish your morning ritual. What could make things easier and more enjoyable though? You knew I was going to say it, and I am, a bathroom radio can really perk up your mornings. While you’re soaping up, you can listen to your favourite tunes and radio shows without worrying about the device breaking because you splashed water on it by accident. They are generally very affordable, and all the top brands have at least one that is sure to get your morning going in all the right ways. Plus, you’d be amazed by how much technology can be packed into one little radio. We understand it’s easy to pick a radio, or know what’s right for you, but we are here to give you a hand with things. 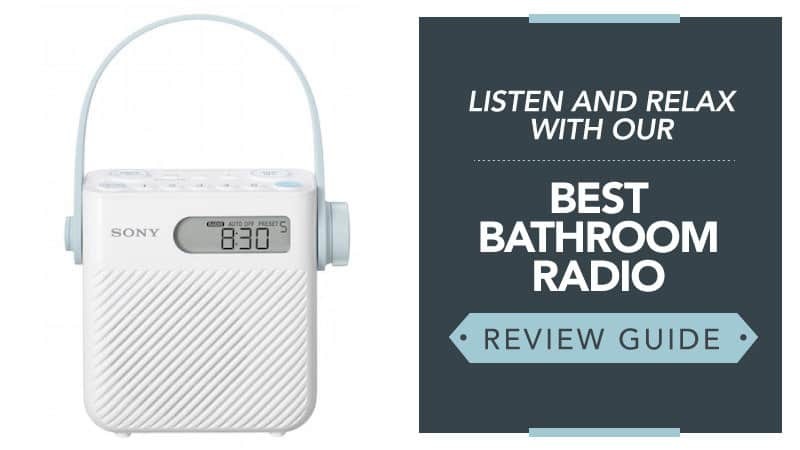 In order to help you find the best bathroom radio, we have put this guide together, compiling all of the relevant bathroom radio reviews in one place, so you can find the best one to shower with every day. What is a Bathroom Radio? A bathroom radio does not have much different than a standard radio, but there are a couple of things that separate them. Generally speaking, they are battery-powered instead of mains, and they are also waterproof or splash proof to ensure that they can be used in a wet environment. They don’t tend to have headphone jacks or an AC adaptor port for safety reasons, and many of them are even able to stick onto the shower wall, or hang from the railing, with ease while you are showering. They are very safe to use, and many of the leading brands are able to supply them. Now that you know a little more about the benefits of having one around, check out the bathroom radio reviews below and see what you think. 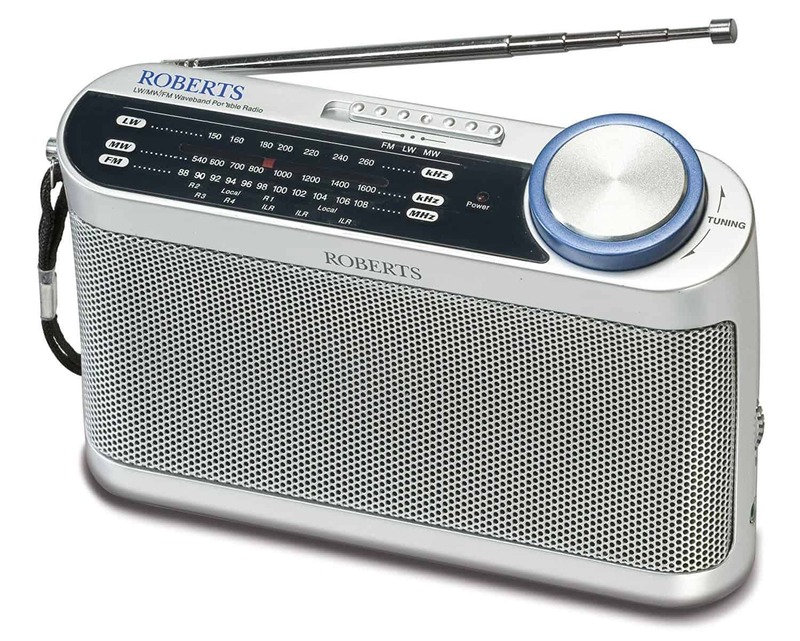 Roberts is a big name with a lot to give, and if you are in need of a bathroom radio system that is reliable, robust, and superb quality, then you may have just found the one for you. All you need to do is take a moment to read below and see if this is going to be your next shower buddy. This bathroom radio system comes in a steel colour and has a retro design that you are sure to love. It is very lightweight and compact, so it will sit nicely by your bathroom window and play while you are showering. 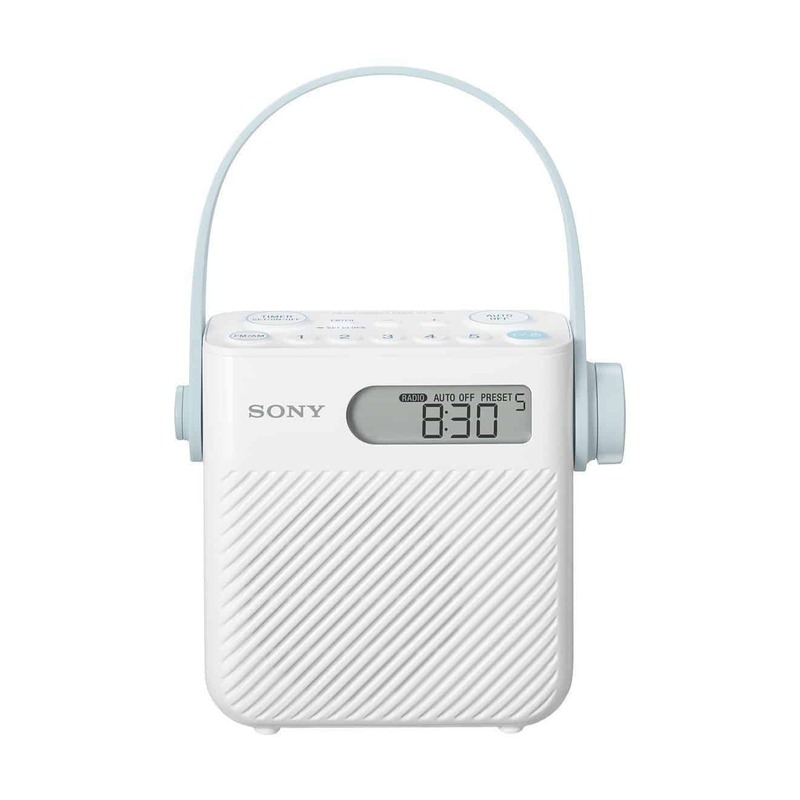 The compact size also means that it can be placed practically anywhere, and there is even a little, but strong, loop on the side of it to allow you to hang it if it is necessary at any time.It is able to access LW, MW, and FM wavelengths, making it a three-band radio that you can rely on. The tuning knob is large and easy to reach, and the angled top panel makes it a little easier to use. It uses batteries to power it up, and has a great lifespan with them, providing you with hours of playtime. There is even an LED indicator that will let you know how much battery it has left. Some customers have found that it can be a little difficult to find the stations that they want when tuning it. This bathroom radio system comes at a fantastic and affordable price, making it ideal for those who are on a budget or don’t want to spend a fortune. While there are some that feel the tuning can be tricky to get around, once you find the station you want you are sure to be impressed by the quality of sound and the reception that you get. Running on batteries and with an LED indicator that lets you know when it starts running low, it really does have everything you need for the perfect shower or bath. Sony is also a fantastic name to go with, and they are known for their superb electronics and music devices. With something from them, you are practically guaranteed success when it comes to your morning routine. Why not take a moment to read below and see what you think of this radio? This bathroom radio comes in white, blending in perfectly with your home and keeping the aesthetics of your bathroom clean and tranquil. It is completely splash proof, which means you don’t need to worry about it shorting out when you accidentally get a little liquid on it. The rubber handle can be detached easily, and also used to hang in the shower so that you can be fully immersed. The sound is big and loud, allowing you to enjoy your favourite stations while you get ready for the day. It has both AM and FM wavelengths, with controls that are really easy to access lined up nicely on the top of the device. The battery life can go on for an incredible 100 hours, with an automatic off setting to save power. There are even five presets included so you can jump between stations easily. Some customers felt that the price was a little high for what it is, especially when compared to other brands. This bathroom radio comes at a fairly reasonable price, and it is a great option for those that want a bathroom radio that can offer a lot. While there are those who felt the price was too high, it isn’t extortionate, and you get more than you do with most bathroom radios – especially in the case of presets. It has a great design, amazing sound that really fills the bathroom, and can hang easily so that it is kept out of the way. Overall, it makes for one of the best models we have here, despite the higher price tag. 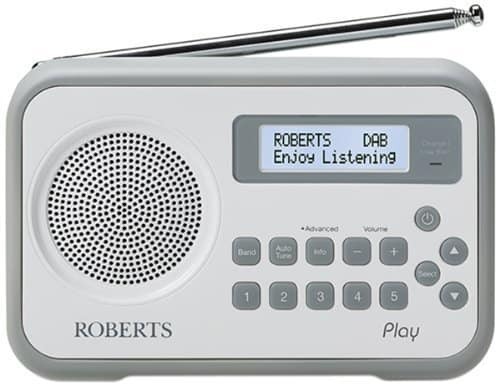 Sliding straight back to Roberts, this is another fantastic model to buy if you want a good quality and reliable digital bathroom radio. It does everything you need to have a good and relaxed listening experience, so take a moment to scroll through the reviews below and see if it’s right for you. This bathroom radio comes in an amazing six colours, making sure that you are able to pick the one that works best for your personal tastes as well as the aesthetics of your home. It is lightweight and portable, sitting beautifully on your bathroom windowsill or just hanging around on the towel rack. The aerial is a good size as well, ensuring that a good signal is picked up while you are showering. It can access both DAB and FM wavelengths, giving you the chance to listen to the shows you love from any band. The display is clear, listing the station, and there are 10 presets that you can use to make channel hopping a little easier. The controls are on the front of the radio and very easy to reach as well as read, with the entire thing being splash proof to give you peace of mind. Some feel that the sound is a little lacking, and that it could have done with more bass. This bathroom radio comes at a reasonable price, and one that you can expect when considering both the brand and the DAB capabilities that it comes with. While some customers would have liked a little more bass and tonal adjustment, it has a brilliant overall sound that you don’t expect to get from the less expensive bathroom radios. It does everything it says it will and more, with a quality that is hard to find in technology these days. The presets are great, the battery life better than average, and it makes for the ideal bathroom buddy. Here are some further models of bathroom radio, just in case the ones above do not quite meet your requirements. 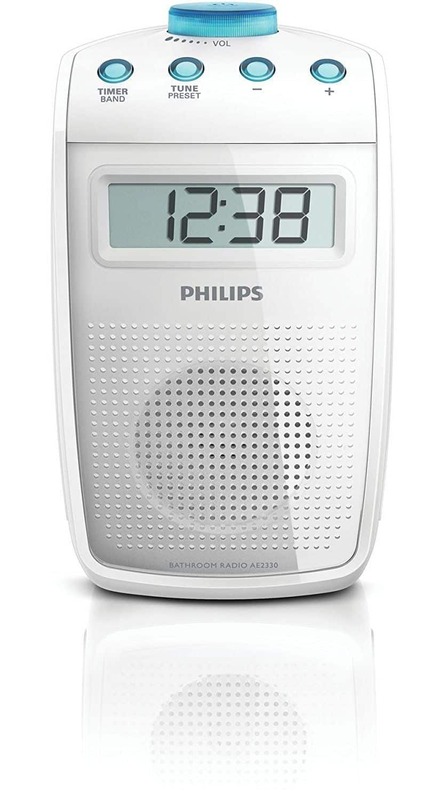 Phillips is an incredibly good and reliable brand, so you should get a lot out of this little clock radio when using it in your bathroom. The first thing to note is that it is splash proof, so you won’t end up with a broken radio after a little water gets flicked at it. The ergonomic handle is anti-slip to help prevent you from dropping it, and you can even set the alarm so that you get out of the shower on time. The clock display is very clear and easy to read, and you may also find yourself pleasantly surprised by the quality of sound that comes from it. You can pre-program it to start playing the radio at a specific time, and all of the controls are easy to access as well as read. All of this comes at a very affordable price. This waterproof bathroom radio sticks to the shower wall and has a cool design that gives off a really modern feel. You can choose between black or blue, allowing you to pick the one that best suits your personal tastes. The LCD screen provides a clear display that shows you the time, current volume, and battery level at all times. You can also view the radio station on the screen by using the controls that are conveniently placed around the display. These are really easy to read and use, and the Bluetooth connectivity means that you can hook your phone up to it as well. Using the built-in microphone, you are even able to take calls while your shower, and it even cancels out the background noise. The battery lasts eight hours while playing music (or 1500 on standby), and it comes at a really good price. 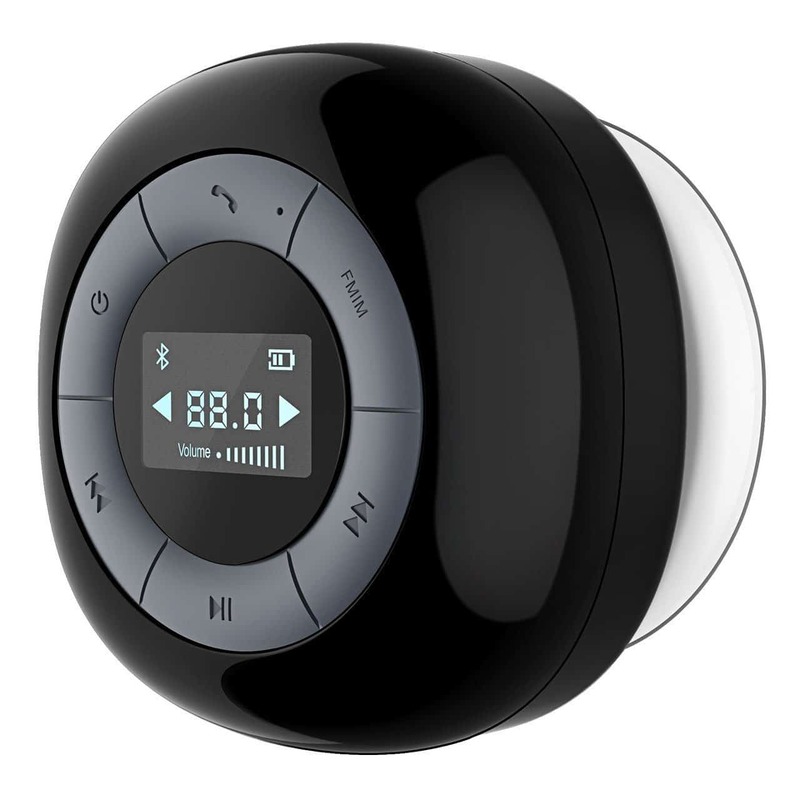 Hopefully, this guide has helped you to find the best bathroom radio, and that it has given you a hand when it comes to figuring out which of these models is going to be the best for use during your morning shower (or bath). It’s not easy to choose one of these models as the best because they all have different designs and functions that make them good. However, anything from Sony is bound to be good, and the brands we have selected to feature here are all incredibly reliable and trustworthy – so you are getting a lot for your money. We have been careful to select models that come in a range of prices, ensuring that everyone has the chance to pick up a radio that they can use when getting ready for the day ahead. We know that at least one of these handy pieces of kit is going to be absolutely perfect for you. What did you think of our bathroom radio guide? Are there any that you would have liked to see or recommended? We love hearing from you, so make sure to leave us a message in the comments below.